Just as others mull the future of the commerce clause, I ponder possibilities for the chicken breast. I always seem to have this protein on hand, and I am in perpetual search for something quick to do with it, using the ingredients I have around the house. Pleased was I to stumble upon Cheap Creamy Chicken Curry. Most people, even those too young to realize it, like chicken curry. 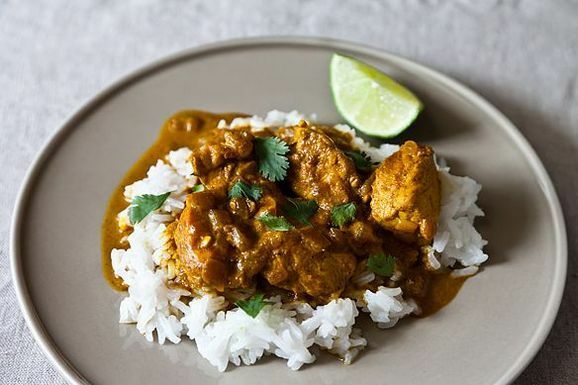 Even mediocre chicken curry gets the job done on a weeknight, but this dish is well beyond that, elevated with an injection of coconut milk and a sort of shake 'n bake technique that more or less seals the lovely spice mix. If you are missing one of the listed spices here, do not fear, as the lime will bail you out in the end. Once your other spices are letting off a nice aroma in the pan, add your chicken. Do not crowd please. Next comes the big show -- coconut milk YUM -- followed by a nice simmer. Do not forget the lime, as it sort of brings all these flavors and the creamy punch of fat together in the pan, finished on the plate with the dash of cilantro. Serve over basmati rice. Have a small slice of cake for dessert. Ask the kids to clean up. Think about what it would be like to visit India, wonder about who has a house there you might scam your way into, think some more about what footwear is best for an Indian sojourn, then go to bed. This was awesome. Perfect amount of heat and spice. I used a whole can of coconut milk;love the stuff. In NJ it's 100 degrees out my door, but our house is comfortable and smells wonderful from creamy chicken curry. Love eating spicy on a hot day. Thanks Jenny and Table9. I made this on a Friday went on a lovely trip down the snake river and had it leftover Sunday Evening after we got back home. It was just as good reheated. Thank you for this addition. I made this last night and was THRILLED with the results. I've been teaching myself to cook over the past 3 years and after tasting this I gave myself a pat on the back and also had seconds. Thanks so much for sharing! This is a great recipe for someone learning to cook. I hope you find many more on the site that grow with you. It was delicious and very welcome on a cold winter night in Australia. Already had requests to do it again. all the way in australia! i am thrilled!! Made this in the pressure cooker with split chicken breasts. (It was a pool night and we needed to start it before we left so we could hoover it after we got back from swimming laps.) The recipe was quite forgiving of my dump and run antics and was a huge hit. The chicken was quite tender. The only sad part about using bony chicken with skin is all the sauce that goes to waste. Definitely adding this one to the rotation, maybe with some added veg next time. Can I make with lite coconut milk? Can I use coconut milk light or will it compromise taste? I have a thick piece of flounder in the fridge and this looks like the perfect way to curry it. Sorry so many folks are in a heat wave. What about making the entire dish, rice and all, mixing and chilling it for a cold, curried chicken salad? I made this even cheaper and easier--I used leftover roast chicken and it was yummy! Great recipe. Chicken thighs would also make the recipe cheaper -- they cost much less than breasts, and are more flavorful! I like the left over idea a lot as long as it was not seasoned with rosemary or something. Thighs are better for flavor I agree though the breasts can be cut into nice bite sizes pieces easily for this. Nothing like hot spicy dish for this outdoor heat. Thanks Jenny...tomorrow nights dinner dilemma solved again! Worked great....the comment was "this is as good as "Taste of India" our local Indian food haunt! Thanks again.